10 summers ago, I went to Vietnam to visit my grandma and relatives and attend my brother’s wedding. DANG! Can’t believe it has almost been 10 years. The trip was super memorable. I learned so much about Vietnamese culture, explored several cities in Southern Vietnam, and ate lots of delicious Vietnamese food every where I went. One of the most BEST things I remembered eating in Vietnam were shellfish grilled directly on a tabletop grill. All the shellfish were fresh and delicious. It was grilled and topped with bubbling scallion oil, crunchy chopped peanuts, and drizzled with a flavorful spicy, fish saucy, sauce. I can still remember vividly hanging out with my cousins, seated outside of the restaurant, devouring dozens of these grilled shellfish and pounding down countless Tiger beers. I’ve tried to find these specific shellfish I ate here in California, but haven’t had any luck. However, using half-shelled mussels are the perfect substitute. These grilled mussels are perfect appetizers for an outdoor BBQ and people will eat it up quick! You can find boxes of half-shelled mussels easily at the local Asian grocery store. Prepare Sauce – Place garlic cloves and Thai chilis in a pestle and crush with a pestle. Add fish sauce, sugar, and lemon juice and mix until sugars are dissolved. Prepare Grill – Set-up two zone fire on the grill for indirect cooking. Grill Mussels – Place mussels on indirect side of the grill. Add 1/2 teaspoon of scallion oil on each mussel. Rotate the grill grate so the mussels can sit directly over the direct heat. Close lid and cook mussels for about 5 minutes or until juices start bubbling. Remove mussels and put on a plate. 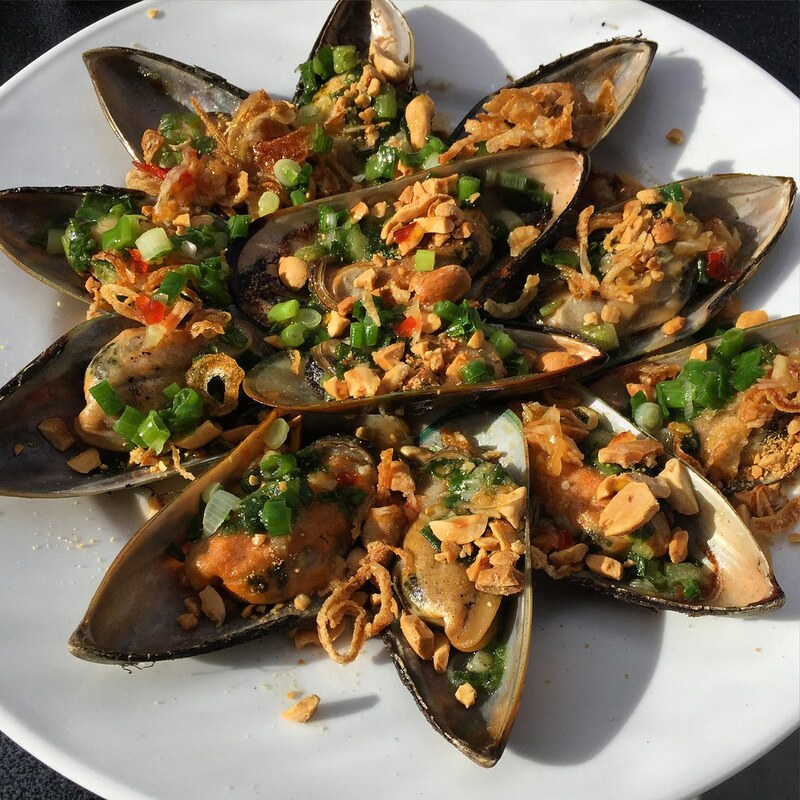 Sprinkle on peanuts and fried shallots and put a little bit of the sauce on top of each mussel. The sauce is very spicy, so you can leave it on the side and let your guest control how much sauce to put on. Works well with other half-shelled shellfish. 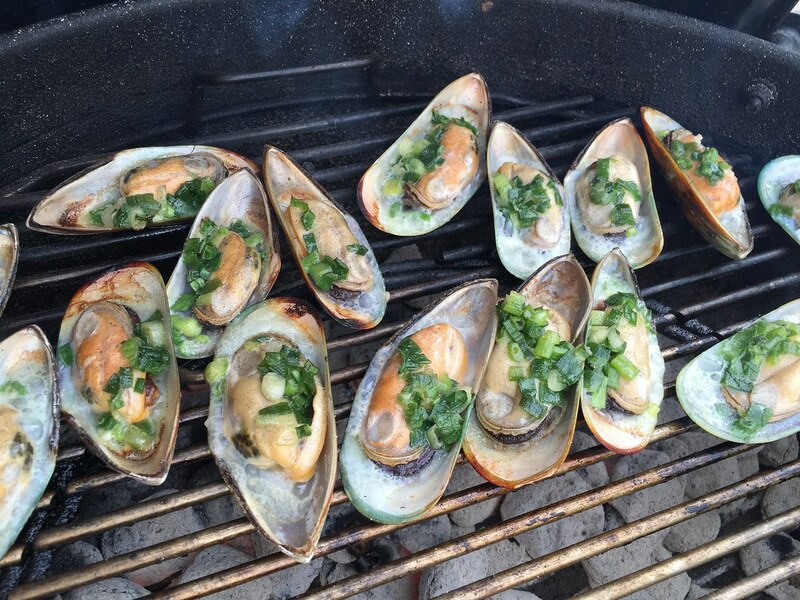 The scallion oil on the shellfish can cause flare ups on the grill so be extra careful.